Monarch's favorite plant in my garden for egg-laying. Very easy to grow from seed. Attractive and neat (height 2-3' width 1-2'). Covered with yellow-orange flowers in summer. Nectar plant for many butterflies. It is grown as an annual except in the warmer climates. 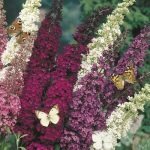 It is not common to find these plants at nurseries or garden stores, but it is easy to start from seed. It takes a couple of months to grow big enough for the garden. These are very easy to grow from seed and are definitely the Monarch Butterfly's favorite host food! Use a plastic sandwich container with lid - the kind you buy at the grocery store, i.e. Glad, etc. or a zip-lock sandwich baggie also works. Take a coffee filter and get it damp. 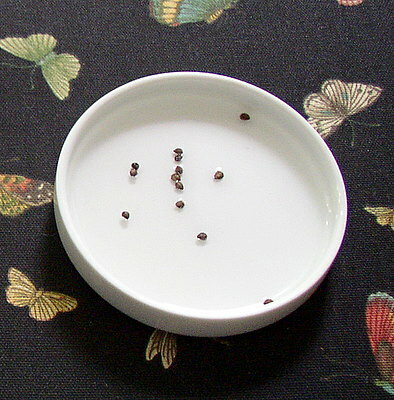 Opened the damp filter and put the seeds on it then fold into fourths. 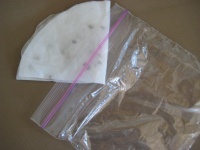 Put the cover on the container (or zip the baggie with a little air in it) and place it somewhere warm (top of frig, on an electric blanket/mat, or I put it on the floor near a heat vent). 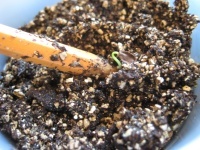 Seeds germinate in about a week or two (faster than when planted in soil). Check seeds during this time....my paper towels were too wet. There was some water sitting in the bottom of the container, so I emptied the excess water and resealed the container. It is better to wait until the seeds have sprouted and are fairly long before planting because they are easier to handle otherwise you might need to use tweezers to plant them. 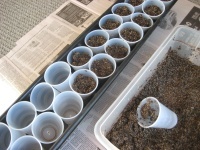 Dampen seed-starting mixture and put in small peat pots or plastic cups with a hole punched in the bottom for drainage. 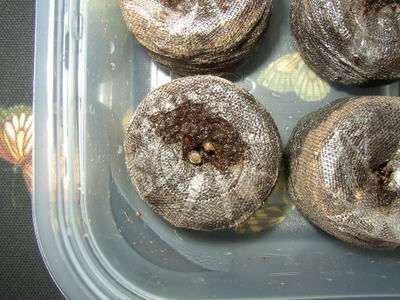 Poke a little hole in mixture with a pencil and put seed in root end down. Place under fluorescent shop lights or near a sunny window (which I did this year and it worked fine). The process below also works, but please note that the Jiffy 7 peat pellets do not disintegrate in the garden, so I will not be using them again. I am trying the peat pots this year, but regular 6 packs work fine, also. NOTE: I just got a tip from a reader on the Jiffy 7 peat pellets. When you are ready to plant the the Jiffy 7s, let them dry out a little and you can remove the mesh before you plant them. Plant milkweed seeds in Jiffy 7 peat pellets....SEE INFORMATION AND NOTE ABOVE.....Keep warm on top of fridge or electric mat/blanket. Theses seeds need warmth to germinate. Place under florescent shop lights when seedlings emerge. Keep within 2" of lights as they grow. 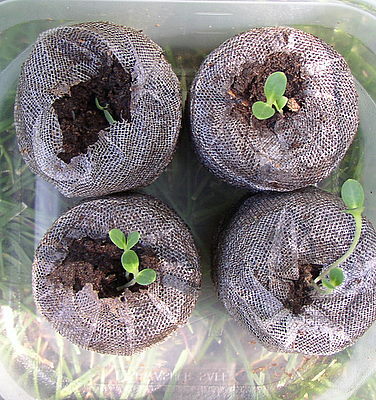 Transplant Jiffy 7s with seedling to pot or plastic cup with hole in bottom. 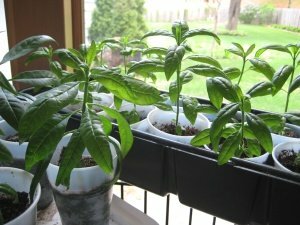 I usually add many Tropical Milkweed plants that I've started from seed to my garden. This assures me an ample supply of butterfly eggs to raise. 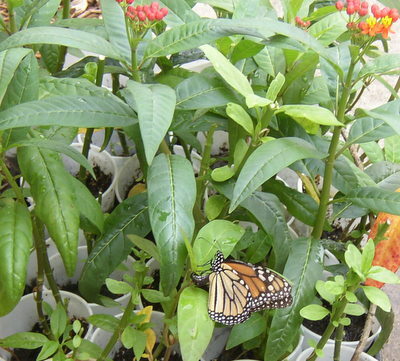 I have also used the potted plants to raise Monarch butterflies indoors. One mature plant feeds one caterpillar. 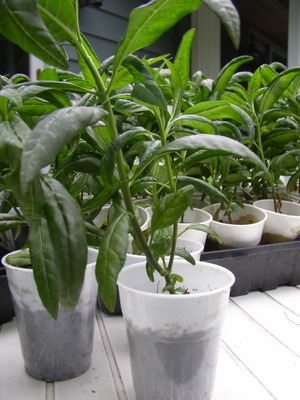 It is best to start Asclepias curassavica indoors 8-12 weeks before the last frost. Notice the Monarch Butterfly laying an egg on it's favorite.......TROPICAL MILKWEED. If you grow them.....Tropical and Swamp Milkweed..... they will come! !